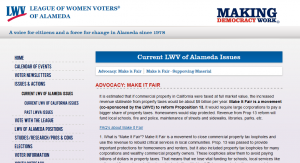 Will the Alameda League of Women Voters Endorse Measure B1? 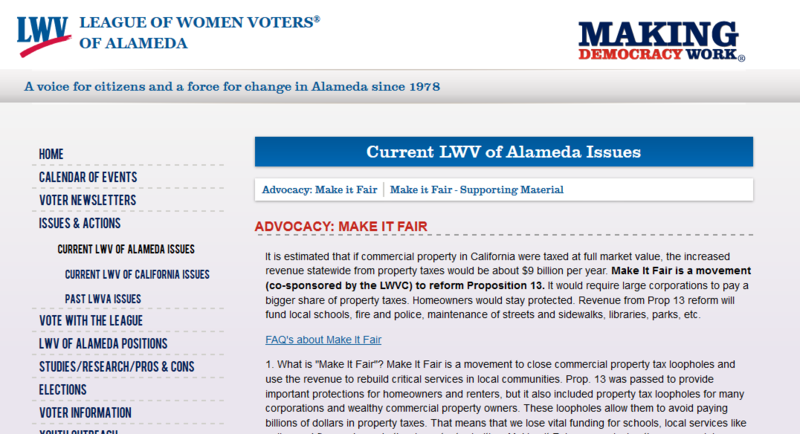 The Alameda League of Women Voters says it wants to close corporate tax loopholes. The Alameda League of Women voters is very concerned about closing corporate tax loopholes. So why would the Alameda League of Women Voters endorse Measure B1, which likewise includes a tax loophole – a cap that benefits only large corporations – and takes vital funding from our schools? The annual tax cap in Measure B1, and the existing parcel tax, protects big corporations by making average homeowners pay more, and limiting the amount that corporations pay. This transfers the cost from Wall Street to Park Street. And Central Avenue. And Lincoln, and Santa Clara, and Haight, and Otis Drive… well, you get the picture. Tell the Alameda League of Women Voters… No on B1! This entry was posted in Alameda and tagged Alameda League of Women Voters, Measure B1 2016 by SOCA. Bookmark the permalink.